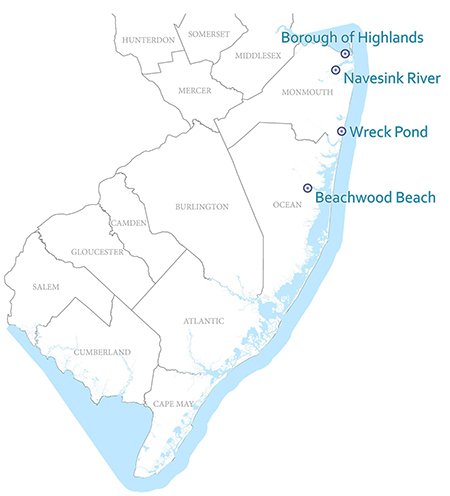 The Nonpoint Source (NPS) Tracking Program targets degraded coastal areas due to sewage infrastructure failures and nonpoint source pollution, specifically those areas in need of water quality remediation. 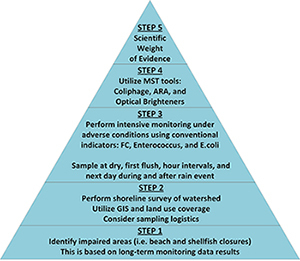 NPS tracking is intricately tied to both shellfish growing waters through the U.S. Food and Drug Administration’s National Shellfish Sanitation Program (NSSP) and beaches through the Cooperative Coastal Monitoring Program (CCMP). It is also used for obtaining data/information needed in the development of the Integrated Water Quality Assessment Report (Integrated Report) and responding to reported incidents. Once an impaired area is identified, existing data and information is researched, reviewed, and analyzed to identify gaps and develop targeted monitoring studies and sanitary surveys. Internal and external partnerships are formed to improve communication, create ownership, and ensure all stakeholders are working toward the same goal of improving water quality while leveraging services and funding sources. Partnering with the community and other government agencies on these issues enables the Bureau to more effectively protect the State's natural resources. The design of any specific source tracking effort will depend on the specifics of the project such as extent and significance of impact, and type of impairment being addressed (e.g. stormwater, septic, or agriculture). Click a map location for project details.